As a leader, husband and father I've always been drawn to think more about what's coming than what is right now. It's both a blessing and a curse. It's a blessing in that I'm constantly planning for what might be around the next corner. But it's also a curse because at times I lose sight of what is right in front of me. I need the people around me (family, teammates and friends) to keep me grounded. 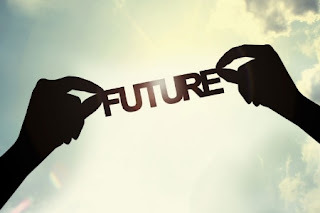 Working in the present while being mindful of the future is a skill I'm learning to develop. The truth about the future is that it is in constant motion, and what we do today, shapes what will be tomorrow. The other truth about the future is that it is a lot closer than we sometimes think. I've heard many grandparents share with me over the years that it "only seems like yesterday" when they were holding their first child, and now as grandparents they find themselves in a completely different stage of life. Time is always moving forward. It never moves backward. Every second that ticks away brings what is coming closer to what is already. The future cannot be avoided. The future may not be televised, but the future is now more than ever. Plan for tomorrow by leading well today. The future is much closer than we think.